Mini chains among cafes are becoming quite the trend in London. Three seems to the be perfect number where the owners can still manage each cafe’s details without things getting away from them. Some of these chains go for the duplicate route, essentially opening the same café in different locations; others tailor each venue to the building and surroundings. The owners Lantana, who also run Salvation Jane in Old Street and Ruby Dock in Camden, definitely have a theme but with little details in each venue to make them individual. This will be the first time I’ve review a second branch of a chain, having already given praise to the excellent Ruby Dock. 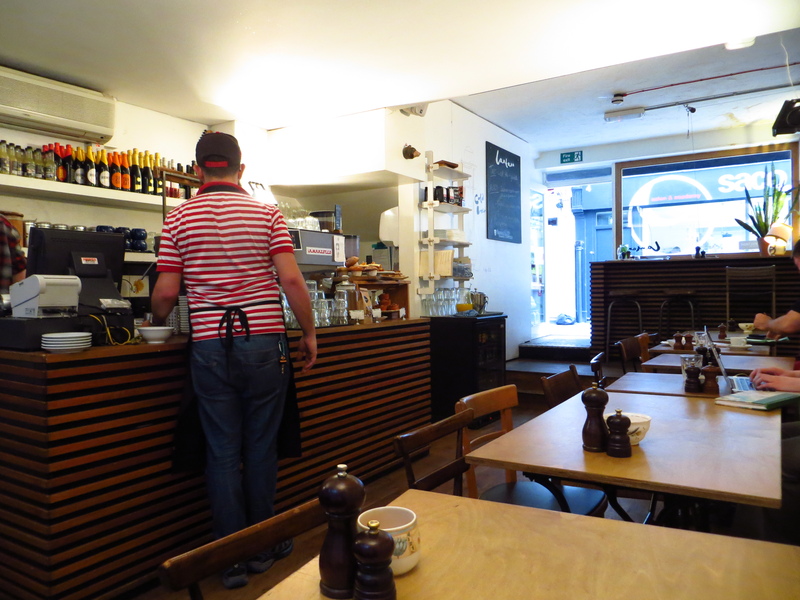 Unlike its Camden brother, which uses Roasting Party beans, Lantana uses Square Mile Coffee. 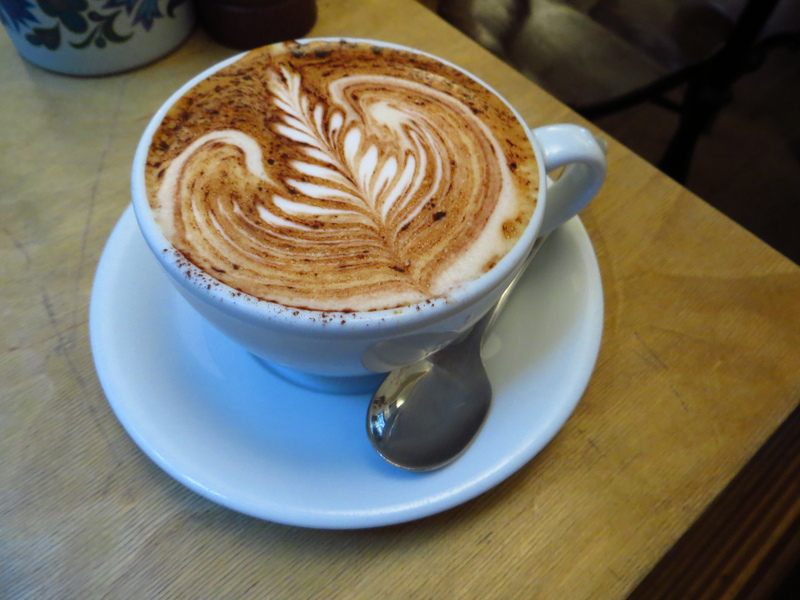 A great cappuccino with plenty of deep, creamy flavours. Made to perfection and a decent size. Also, for a city centre location, its £2.60 price tag is not too bad. Tucked down a back alley, it’s a cute little place if a little dark. They’ve tried to brighten it with white walls and a great mural. The seating was reasonably comfy but I feel that they’ve gone for the wrong vibe. Instead of cool, minimalist, they should embrace the dark, side-street feel and gone full out dive bar feel. Still, it’s one of the more unique places to grab a coffee around Goodge Street. A great selection on both its breakfast and lunch menus. Dishes include Asian shredded pork salad, Crispy Chicken and bacon burger and Slow cooked baked beans with ham hock on caraway rye bread with herb feta. Prices aren’t too bad, though the lunches start to look a little expensive when you’re paying £13.50 for a beef sandwich. No issues here – fast and friendly. The coffee was well made and in a speedy manner. Not much extra apart from catering and some wall art for sale. 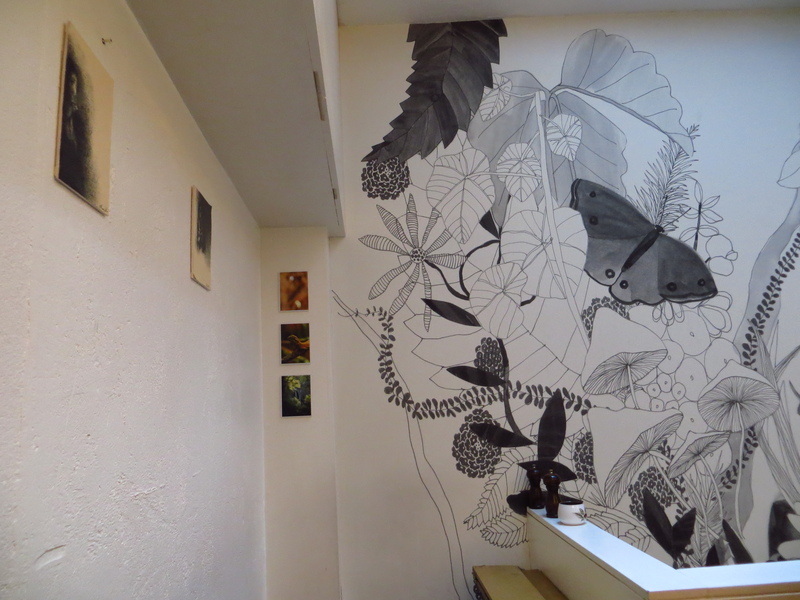 A cool little place and something a bit different if you’re in Goodge Street. While it’s stuck to a similar design to Ruby Dock, I feel it should have stamped its own style onto the location.